This article was originally written in April 2007 for the food & drink website Taste T.O., and republished here in September 2011 (but back-dated to match the original publication date) after the Taste T.O. blog was shut down and taken offline. While they won’t be officially given out until tomorrow, this year’s edition of the Ontario Beer Awards have already caused some controversy in the local beer geek scene thanks to a leaked list of winners being posted to the discussion forum at BarTowel.com. This competition tends to cause some minor grumbling every year due to the fact that the credentials of some of the judging panel are somewhat questionable – for example, the bios of some judges use phrases like “he’s been throwing keg parties since he turned 19” as proof of their suitability for the position. But this year, the complaints went into overdrive when it was discovered that the notorious Steelback Brewery somehow managed to win four medals, including gold in the Dark Lager and Honey Beer categories. Unfortunately, this controversy – however justified it might be – is bound to overshadow the fact that several very deserving beers also won awards. 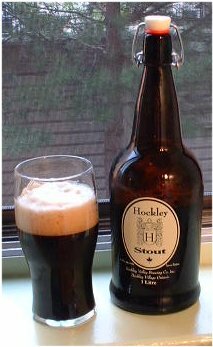 One of those beers is Hockley Dark, a brown ale from Orangeville’s Hockley Valley Brewing that’s been on LCBO shelves and a few bar tap lines for the past three years or so. This is a beer that tends to fly under the radar for a lot of local beer drinkers, perhaps because many of them look upon brown ales as an unexciting and non-challenging style, but if I may steal the motto of a more popular mainstream brew: Those who like it, like it a lot. To be honest, it took me a few tries to bring me on board, but now I’m a serious fan of this brew, especially when I can find some fresh cans (easy to tell thanks to the date stamp on the bottom). It has a nice dark ruby-brown colour with a fairly still body, and a pleasing aroma of roasted malt, brown sugar, cocoa and woody hops. The body is soft and light, which surprises those who expect all dark beers to be big and heavy, and the flavour is full without being overpowering, with notes of malt, licorice, coffee, roasted nuts, and a slowly developing hop bitterness in the finish. This is an understated and under-appreciated gem of a beer, and well deserving of the gold medal it has won in the Dark Ale category. If you’d like to give it a try yourself, it can be found at many local LCBO locations (LCBO 34660, $2.50/473 mL can) and on tap at a few of Toronto’s better beer bars.